Details : Hill Farm Certificated Location is in a rural setting, and yet conveniently located for easy access to the A12. The coast at Dunwich is less than 5 miles away. It is open all year and adults, children and pets are all welcome. The site is located on a large, south-facing, flat field with mesh protected grass pitches, electrical hook-ups and ample space for awnings. The site is surrounded by mature hedges and is abutted by arable fields and young woodland to the north, although Hill Farm itself is no longer a working farm. 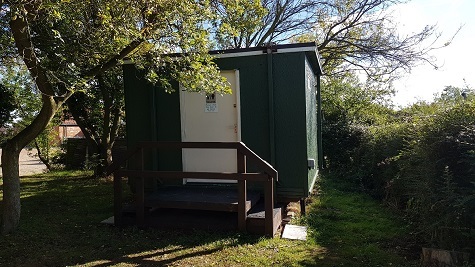 There is a WC, washbasin, shower, ladies and gents toilet block with hot water for handwashing, washing machine and free Wi-Fi available across the whole site. Each pitch has its own drinking water tap. The 4-5 acre young woodland behind the CL site is accessible for dog walking. 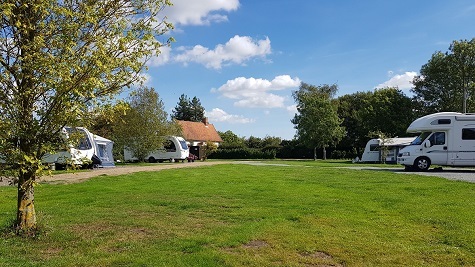 The site is an excellent base for exploring the surrounding coastal areas, especially the beautiful seaside towns of Southwold (9 miles away) and Aldeburgh (14 miles away). The popular village of Westleton is approximately 1.5 miles away and here there is a restaurant, village stores, a garage, an art gallery and 2 pubs, including the well-respected Crown Inn. 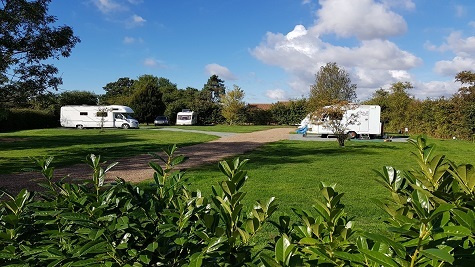 There are also many nearby attractions, such as Orford and Framlingham castles, museums, the National Trust Site at Dunwich, the famous RSPB Minsmere Nature Reserve and the charming town of Woodbridge, near to the Anglo-Saxon burial ground of Sutton Hoo. There are two local shops within a mile of the site selling local produce and a garage. There are also numerous local pubs, restaurants and cafes. The village of Darsham is a mile from Hill Farm and has a pub, The Fox Inn, serving very good food. Darsham railway station is just over a mile from the CL site and has services to London's Liverpool Street Station via Ipswich. The town of Saxmundham is 5 miles away, with Tesco and Waitrose supermarkets. Snape, with its world famous concert hall, is just over 10 miles away. The increasingly popular Latitude Music Festival on the Henham Estate in July is about 6 miles away. The woodlands, heathlands and coast are perfect for those who enjoy walking and bird watching, and the country lanes are great for cycling. 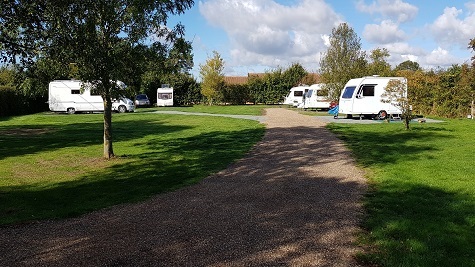 There are also two high quality holiday lodges next to the site (each sleeping a maximum of 4 people, with 2 bedrooms) which offer accommodation for friends and relatives visiting without a caravan. The owner lives nearby to deal with any problems and does regular site maintenance. 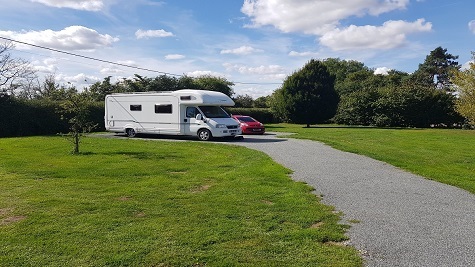 This site is becoming increasingly popular, so advanced booking is necessary and payment is due on arrival. 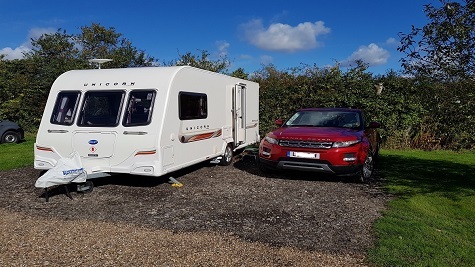 If you have not prebooked, please do not park your unit on site until you have checked availability. Please vacate your pitch by 11.30am on the day of departure. (Sorry we cannot accept credit cards.) More on our Web Site. 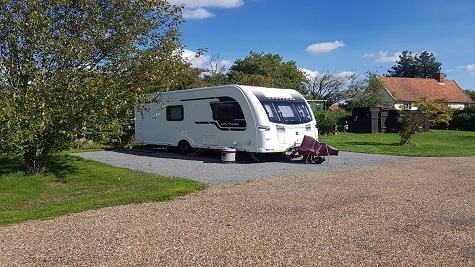 Facilities : Electric hook up available, Easy access, Suitable for Caravans and Motorhomes, Serviced Grass & Hardstanding pitches, Toilet, Shower, Laundry facilities, Shop nearby, Pub/Restaurant nearby, Wifi, Dogs allowed, Self catering cottages. We stayed for 2 nights in mid August. There are 5 generous pitches, 4 of which are hard standing. On arrival we called the owner Jaik who arrived promptly to welcome us and to give us a comprehensive information sheet about both the site and the surrounding area. This is exactly what is needed at any site. The surroundings are lovely and the facilities are good. There are clean toilets and a shower which was clean and hot if somewhat unusal! There is water and electricity on each pitch making life very easy. Jaik has obviously put a lot of thought and effort into the site and is just as obviously continuing to do so. It's a fantastic location from which to visit the delights of Suffolk. We intend to return again next year. Excellent well positioned site for visiting Suffolk coast. Easy to locate, well maintained, level, excellent facilities as described by the club details. Four of the five pitches are hardstanding (including road access to these pitches. At time of writing old site pictures don’t show this). Mr Campbell was a very friendly and helpful owner, who makes the effort to make this one the best CLs I have stayed on. Info sheet provided on arrival (pub and shop approx. 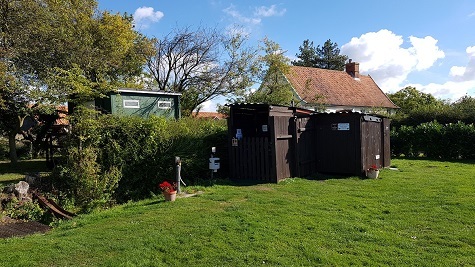 1 mile away, pebbly beach 4 miles), clean and accessible toilet emptying point, individual water taps, electrical hook up within easy reach and free Wi-Fi connectivity. Spent over a fortnight here, and never short of somewhere to visit! Directions : Pass through Yoxford (Yoxford-Lowestoft A12) and continue over level crossings at Darsham Station, within 1 mile turn right, 2nd turning on right after crossing into Lymballs Lane. Site on Left within 270 metres. If pre-booked pitch and owner will call. If not pre-booked park and call at the house thank you.